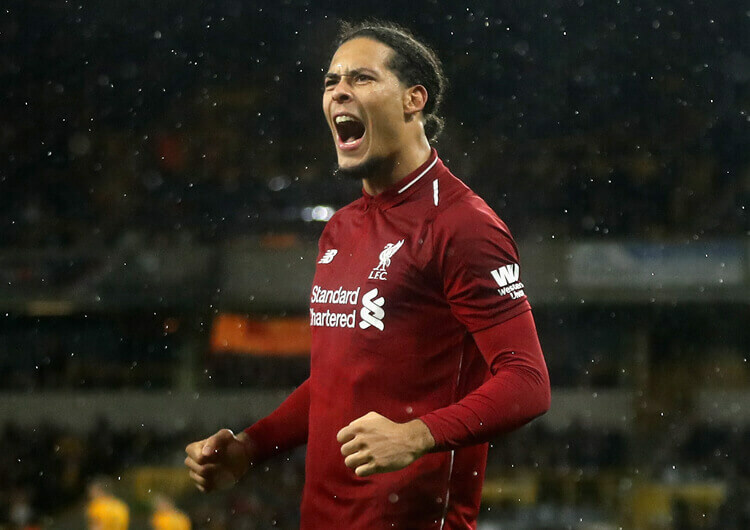 Liverpool kept their title hopes alive with an emphatic home victory over Chelsea on an emotional Sunday afternoon at Anfield. On the 30th anniversary of Hillsborough, the Reds took to the field knowing Manchester City had maintained their blistering pace at the top of the table with a 3-1 win at Crystal Palace earlier in the day, and that they were without a home win over Chelsea for almost seven years. The run looked in danger of continuing after a goalless first half, but Jurgen Klopp’s team came out with renewed purpose for the second period and were ahead within six minutes of the restart when Sadio Mane headed home a Jordan Henderson cross. Two minutes later, the Kop exploded when Mo Salah cut inside and unleashed a piledriver past Kepa in the Chelsea goal to double the lead. Eden Hazard had two golden chances to bring the visitors back into the game, but the post and then Alisson denied the little Belgian – and Liverpool saw the game out to keep the relentless race for the title going. 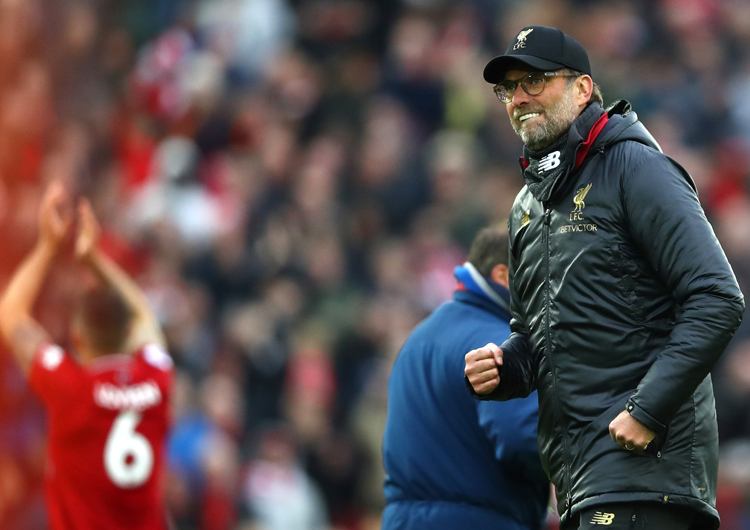 Jurgen Klopp set Liverpool up in a 4-1-4-1 formation, with Fabinho operating between the defensive and midfield lines. 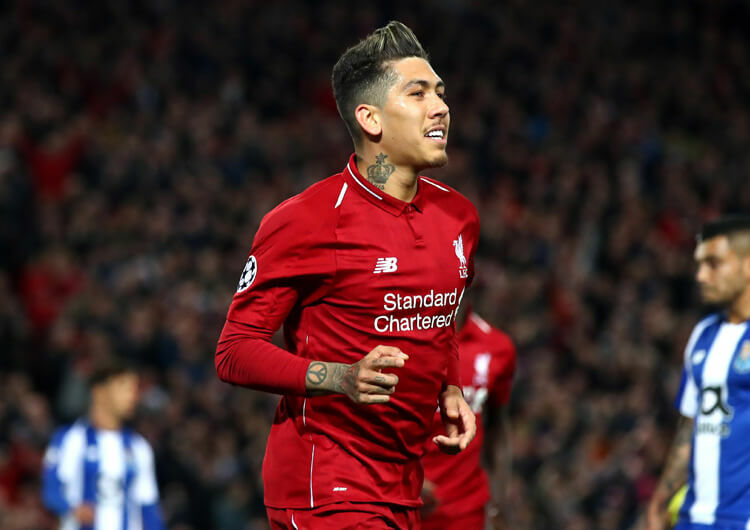 Mo Salah, Jordan Henderson, Naby Keita and Sadio Mane played as a line of four attacking midfielders across the pitch, behind Roberto Firmino. The hosts dominated the ball, registering 58 per cent of possession and 16 shots. They had to be patient in possession, and would look to switch the point of attack on a regular basis in a bid to find gaps within the Chelsea block. The key to Liverpool’s attacking strategy was the relationship between full-back, wide attacker and inside attacking midfielder: Trent Alexander-Arnold, Salah and Henderson on the right, Andy Robertson, Mane and Keita on the left. The understanding and co-ordination between each trio worked to unbalance Chelsea in the build-up to both Liverpool’s goals. Simply, one would stay deeper, one would provide the width and one would operate inside; the rotation of these roles is where Liverpool found their success. The Reds would look to play to Salah’s feet out wide. 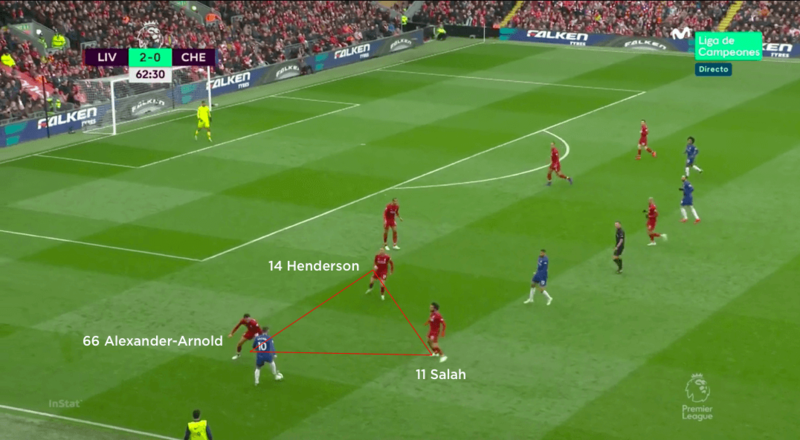 At this point, one of Henderson or Alexander-Arnold would look to make a run to take whoever of Jorginho, Willian or Ruben Loftus-Cheek was tracking them away, thus creating the space for Salah to drive inside with the ball. An underlapping forward run from Henderson led to the cross he played for Mane to head home the opener, while another only moments later created the space for Salah to cut inside and hammer home Liverpool’s second. In the earlier build-up phases, Liverpool had the option to play into Firmino’s feet on the blindside of Jorginho when Keita and Henderson were being screened by N’Golo Kante and Loftus-Cheek. 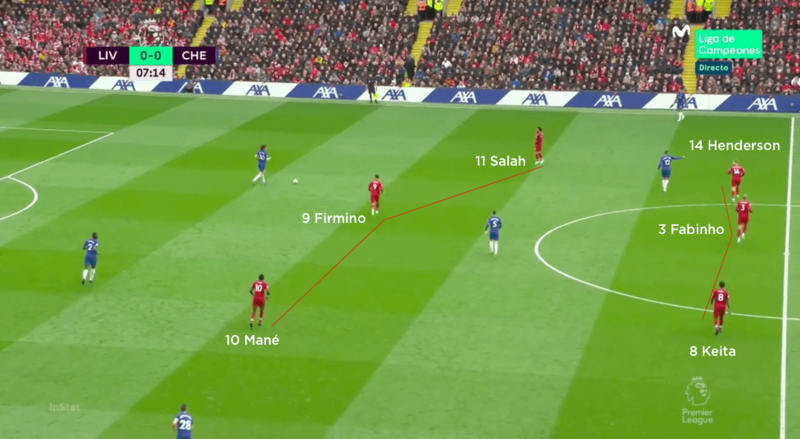 The Chelsea back line were reluctant to drop with Firmino, perhaps due to the threat posed by Salah and Mane in behind. Once the Brazilian had received the ball, he could link with his attacking midfielders to continue the attack. Out of possession, Liverpool set up in a 4-3-3 shape; Keita and Henderson joined Fabinho to create the midfield line, while Salah and Mane pushed up alongside Firmino in the top line. The hosts tried to press Chelsea high when they built from the back. Mane would close down Antonio Rudiger and block the passing line to Cesar Azpilicueta; Firmino pressed David Luiz, Fabinho jumped up to press Jorginho and Keita would screen Kante, but be in a position to go and press Azpilicueta if the right-back had the ball. If Liverpool chose not to press, then Salah and Mane would be stationed between the full-back and centre-back on their side, with Firmino in between the centre-backs. 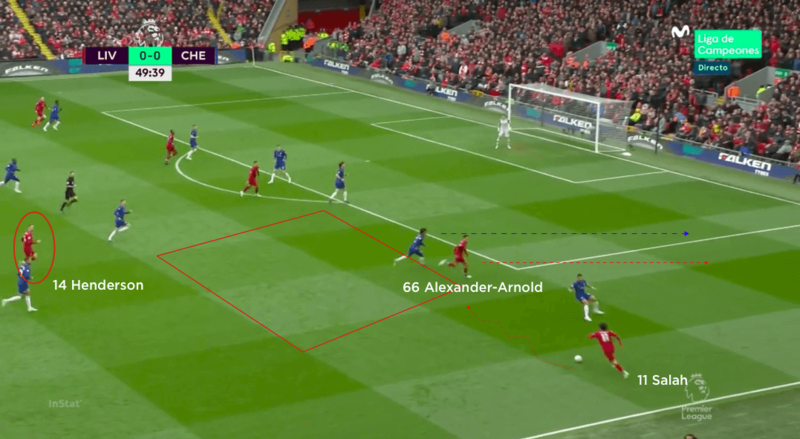 The Reds’ midfield would be compact and within the horizontal distance of the Liverpool front three, making it difficult for Chelsea to play inside. Keita and Henderson would be responsible for Kante and Loftus-Cheek, with Firmino looking to screen Jorginho but Fabinho ready to pounce if needed. 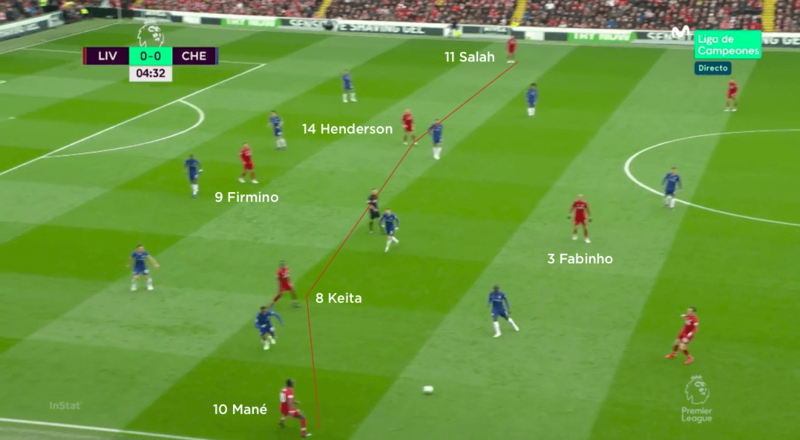 As Chelsea grew into the game and Liverpool had to defend more, Salah and Mane showed their work rate out of possession by tracking back to help the midfield. 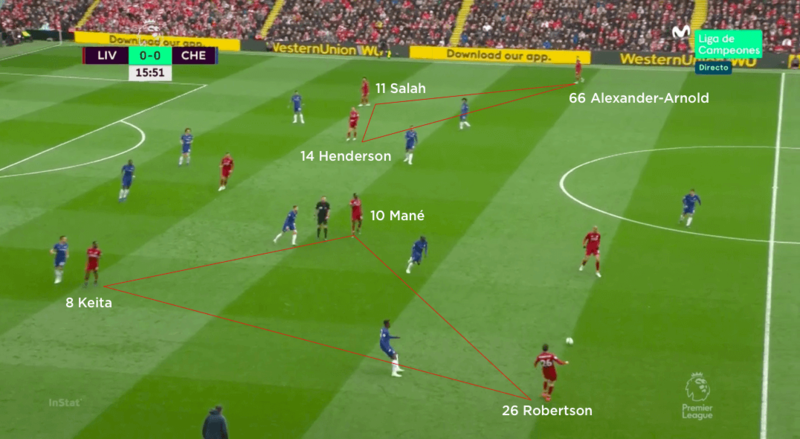 As the ball moved out to the Chelsea full-backs or wide attackers in the second half, Henderson or Keita would move out to delay them if they were only just inside Liverpool’s half, while Alexander-Arnold and Robertson stayed inside to cover. If possession was further up, then the Liverpool full-back would go out to engage, with Henderson or Keita covering inside. They would be joined by Salah or Mane in a triangle designed to prevent Chelsea from moving back inside. Liverpool set up in a 4-1-4-1 formation. 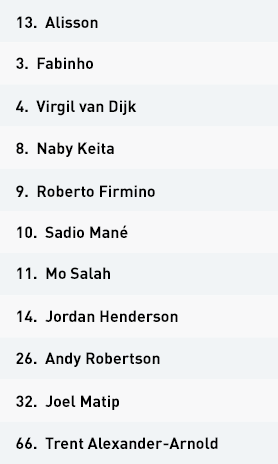 Mo Salah, Jordan Henderson, Naby Keita and Sadio Mane formed an attacking midfield line of four behind Roberto Firmino, while Fabinho sat between the midfield and defence. The Reds dropped into their familiar 4-3-3 shape out of possession. Keita and Henderson dropped alongside Fabinho, with Salah and Mane playing up with Firmino on the top line. 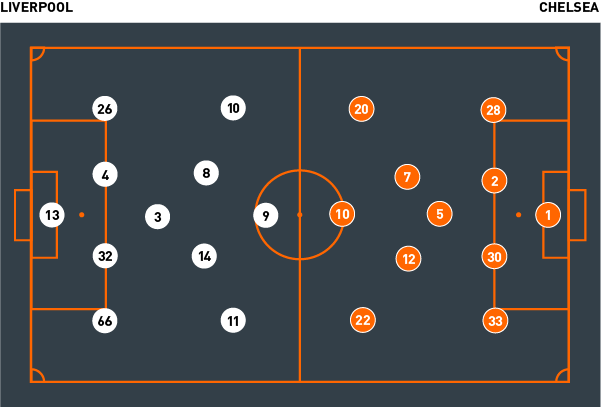 The home side’s attacking strategy relied largely on triangles comprising full-back, attacking midfielder and wide attacker on each side: Keita, Mane and Andy Robertson on the left, Henderson, Salah and Trent Alexander-Arnold on the right. Rotation within these triangles created space for the wide attackers to cut inside on their stronger sides – in this case Salah on the right. It was from a similar move that the Egyptian crashed home Liverpool’s second goal. The same combinations worked together to frustrate Chelsea at the other end of the pitch – both Salah and Mane showed great work rate to get back and assist in defensive areas. Chelsea set up in a 4-1-4-1 formation in possession, with Jorginho sitting between the defensive and midfield lines. Eden Hazard started as the central striker, with Callum Hudson-Odoi, N’Golo Kante, Ruben Loftus-Cheek and Willian across midfield. The Blues dropped into a 4-5-1 shape out of possession, with the midfield four dropping deeper alongside Jorginho. Hazard was left alone on the top line. The visitors looked to drop Hazard in as much as possible to link play with his midfielders – but Chelsea struggled to get decent numbers around him in a difficult first half. In the second half, Maurizio Sarri introduced Gonzalo Higuain as the central striker. Higuain also then dropped, allowing Hazard to make runs on the blindside of the Liverpool defence from his favoured position on the left. Maurizio Sarri set Chelsea set up in a 4-1-4-1 formation, with Jorginho in between the defensive and midfield lines. Callum Hudson-Odoi, Ruben Loftus-Cheek, N’Golo Kante and Willian formed the attacking midfield line behind Eden Hazard, who played as the lone centre forward. The visitors struggled to create opportunities in the first half, with Hazard often isolated. They tried to drop the Belgian towards the ball and use him to link play with midfield before spinning to run in behind, but he was often outnumbered when running in behind and so struggled to create any meaningful chances. 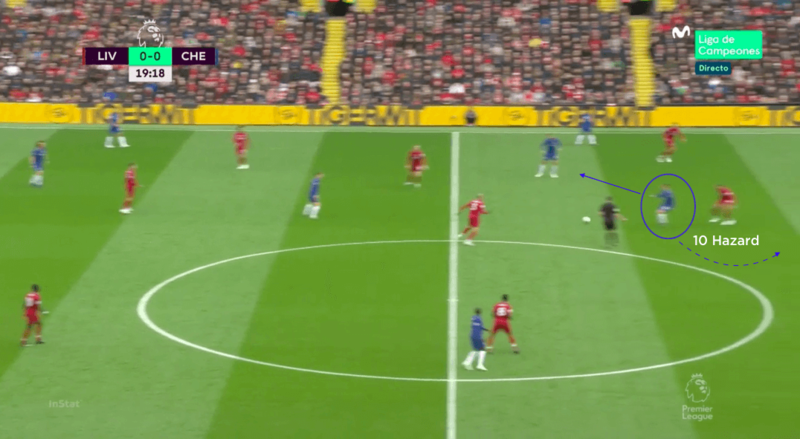 Chelsea also looked to play long passes in behind from deep for Willian to chase, but Liverpool dealt well with this and generally managed to either shepherd the ball out of play or keep Willian away from goal. In the second half, and after falling behind, the Blues introduced Gonzalo Higuain as the central striker and moved Hazard out wide. 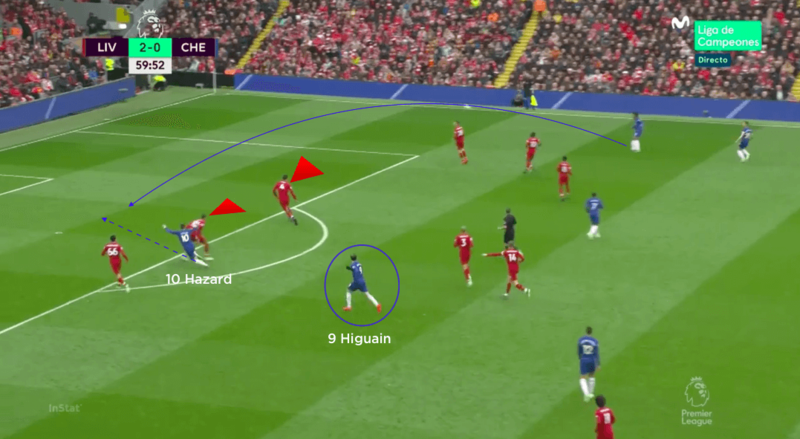 This achieved two things: first, Hazard was able to get the ball to feet more and run with it; and second, as the attack was developing, he would be able to make his runs from deeper and on the blindside of the Liverpool defenders. Chelsea created two golden opportunities in this way, but the post and then Alisson denied Hazard both times. 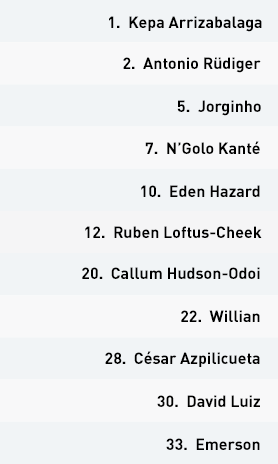 Out of possession, Chelsea dropped into a 4-5-1 and would operate mostly in a mid-block, with Hudson-Odoi, Loftus-Cheek, Jorginho, Kante and Willian forming a five-man midfield behind Hazard. 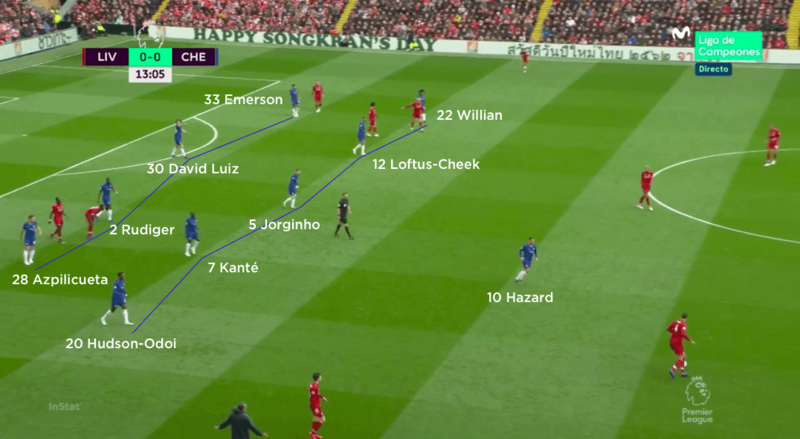 They applied a mid-press, with Loftus-Cheek moving out to close down Joel Matip and Kante doing the same to Virgil van Dijk; Liverpool would then move the ball to their full-backs, but the Chelsea midfield line would still be in a position to engage. If Hudson-Odoi or Willian pressed the Liverpool centre-backs, Liverpool were able to bounce the ball inside to Fabinho, who would play out to Alexander-Arnold or Robertson in more advanced positions. 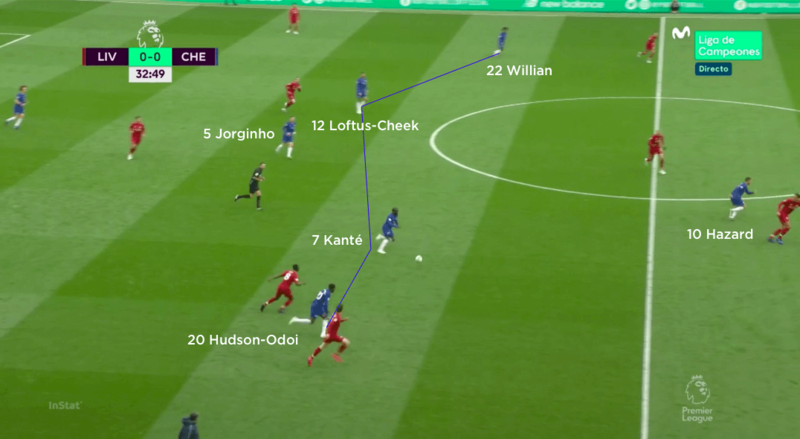 If Chelsea were still in shape at this point, then Hudson-Odoi or Willian would close the full-backs down and look to show them inside; Loftus-Cheek and Kante would then screen the pass inside, while Jorginho would move across in case the screen wasn’t successful. Chelsea struggled to deal with the many rotations within the Liverpool midfield, however, and found themselves consistently dragged around by the movement of the home side in attacking areas. In the end, this proved the difference as the Blues fell to a first Anfield defeat in seven years.